How Is the International Money Transfer Market Evolving? The market of international money transfer ("remittances") has been growing considerably at a CAGR of 10.4% since 2000. $530 billion is transferred each year. Pressure from the G20 and UN to lower costs for senders has resulted in fees for transfers declining year-on-year since 2008. 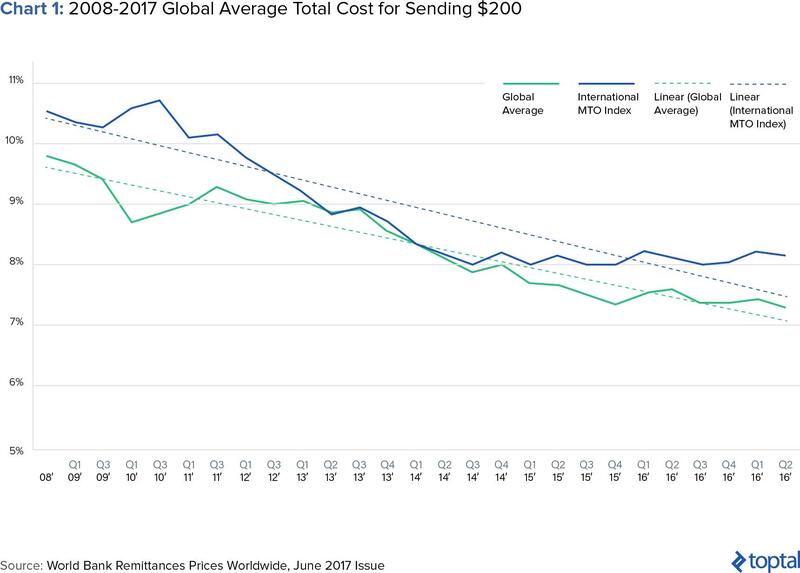 It now costs on average 7.21% to send money abroad. 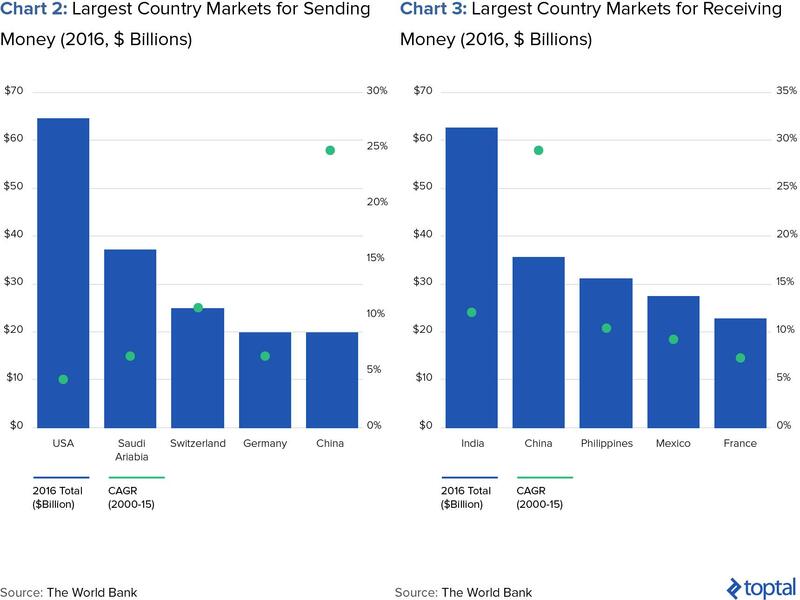 The USA is the country that sends the most money, India receives the most money and China has the most even balance between sending and receiving. Western Union processes over $70 billion in payments every year, more than double that of its nearest competitor, UAE Exchange. The highest volume from a Fintech "newcomer" is from 6-year old Transferwise, which is ranked 5th in the world. With fees falling, MTOs are now differentiating themselves from their competitors by offering new services to increase customer loyalty, such as payroll services, virtual bank accounts, and prepaid debit cards. Trying to increase FX charges is a potentially dangerous move to make, as customers are more cognizant to the real cost of FX through transparency efforts by competitors. To respond to the increased competition, Western Union is focusing more on small businesses, offering innovative tools such as hedging and marketplaces for customers to connect. Have 500,000 branches in its network affects its ability to respond to cheaper electronic transfer services. Western Union runs the risk of being disrupted significantly, in a similar vein to how Blockbuster Video was by online video-on-demand services. 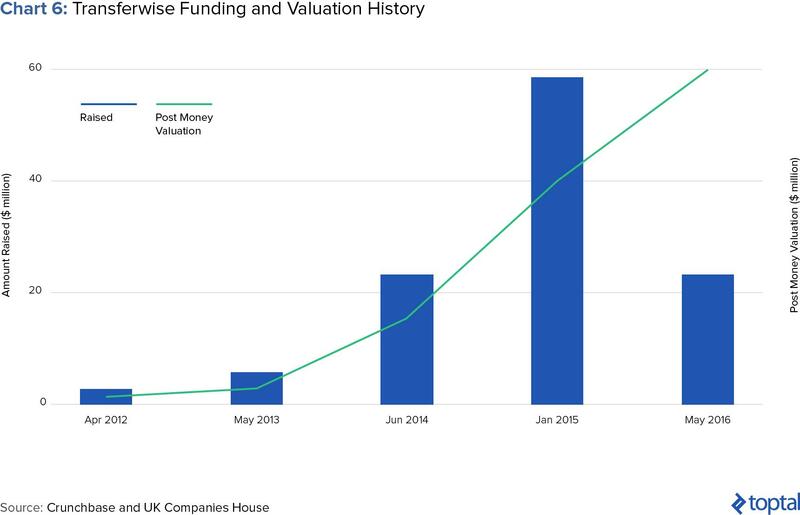 Formed in Estonia in 2011, six years on, Transferwise is predicted to reach a valuation of $1.6 billion in 2017. It now has a profitable business model and significant market share (10%) in its primary market, the UK. It offers customers very competitive fee prices (0.5% for EUR to USD) and famously does not pass on any FX costs, which it attempts to mitigate through bypassing banks with its peer-to-peer exchange model. Reaching a break-even point with such attractive customer pricing suggests that Transferwise has significant scale, in terms of number of transactions and an efficient technological operational back-end. Its moves into transactional banking via its "Borderless Account" offering show that it plans on transitioning more into the banking space, to capture more transactions from customers and maintain passive account balances. Xoom IPOed in 2013 and was bought by PayPal for $890 million in 2015. Alongside its acquirer, it remains one of the most significant exits for investors in the money transfer space. It offers a very straightforward business model of only sending money for US-based customers, albeit with a wide range of options for inbound remittances (cash pickup, mobile topup, and electronic transfer). PayPal's interest in Xoom came due to its vast network of physical affiliate agents around the world, which augmented PayPal's strength in internet payments and processing. By focusing on its core strength and not stretching itself across many different business functions, Xoom was able to perfect its business model and present itself as an attractive investment for both its IPO investors and PayPal. With international money transfer displaying characteristics of a commodity market, its players need to differentiate themselves from the competition with more value-added services to retain customer loyalty. Brand value: Loyalty and trust from customers due to being a transparent and reliable service. Depth of agents/banks in its affiliate network: Offering more options to senders and receivers increases the utility offered to them and makes them stickier. Proprietary technology: Using technology to lower customers' costs and win business through making transfers faster and more reliably. Sending money abroad has traditionally been an arduous and expensive task, exemplified by never-ending chains of middlemen, manual paperwork, and hidden charges. Fortunately, developments in the industry over the past couple of years mean that individuals and even small-to-mid-sized companies can now enjoy faster, cheaper, and value-added foreign money transfer services. These are all benefits which larger corporates, banks, and governments have traditionally held through their direct access to the institutional foreign exchange market, which exchanges $4.8 trillion of transactions each day. In this article, the key challenges of the MTO sector will be outlined, and three significant industry players will have their strategies analyzed to provide a clearer understanding of how the sector is evolving and what potential there is for investors to realize returns from the industry. Costs have been falling as a result of healthier competition and due to pressure from the G20 and the UN, who are targeting an average cost to consumer of 5% and 3% respectively. These bodies pay particular attention and effort to the remittance services market due to its popularity with low-wage workers and the role remittances play in economic development in emerging markets. Banks are facing the highest pressure from this drive to reduce fees, as they are the most expensive remittance providers, with an average cost (World Bank Q3 2017) of 11.0%, compared to MTOs at 6.1%. In terms of who is handling the remittances, MTOs dominate the market. Western Union has more than double the market share of its nearest competitor, UAE Exchange. 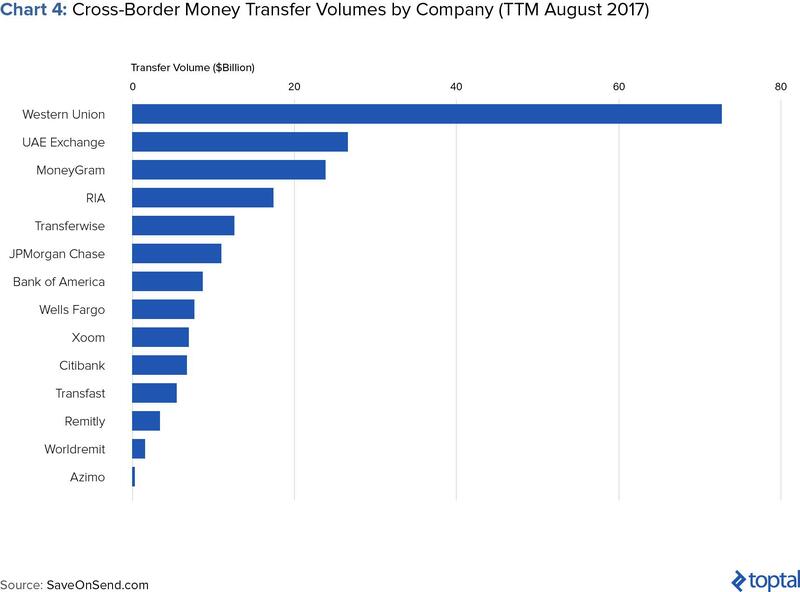 Despite payments and remittances receiving attention from new fintech startups, within the top five providers by volume there is only one recent newcomer, Transferwise. Chart 4 below shows the competitive landscape of the market. The heavy pressure from international organizations (G20, UN, etc.) to lower the costs of remittances for users is placing its main players under increased scrutiny toward their prices. Considering that banks charge the highest prices, one would expect them to be feeling the most pressure from this movement, but banks are diversified organizations with many other sources of revenue. 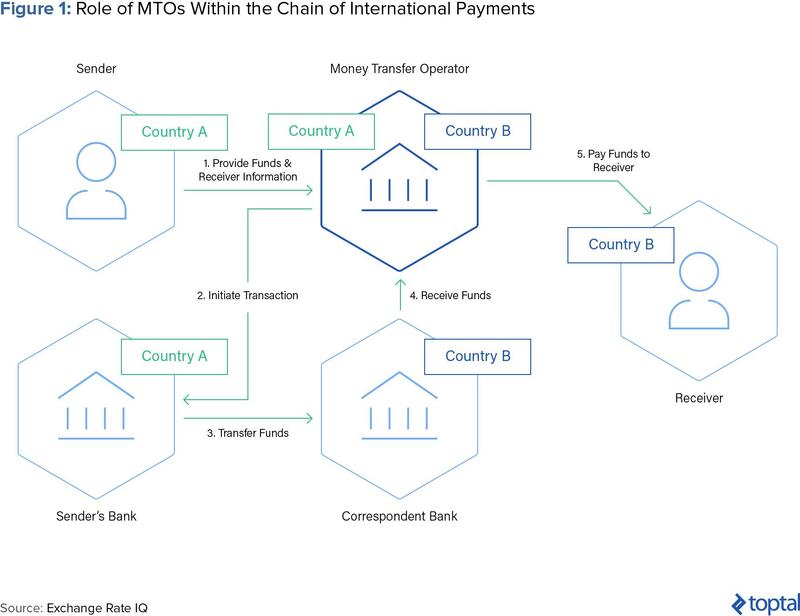 International payments is not a core service for a bank, compared to an MTO, which is their entire raison d’être. Revenue for international money transfer companies is divided into two parts: a transaction fee and the foreign exchange (“FX”) spread charged to the consumer. Western Union, for example, had a split of 70% and 27% between fee and FX revenue respectively in its 2016 results. 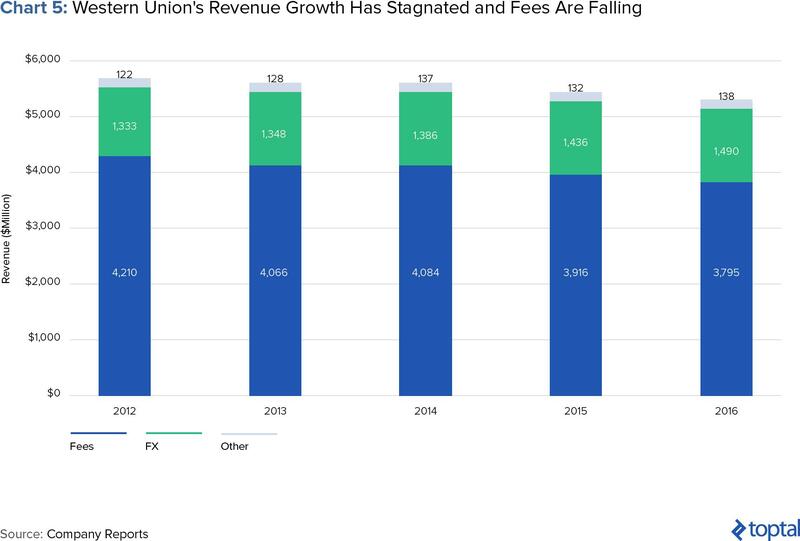 To better analyze how the changes in the market have affected the fortunes of its players, let’s now look at the strategy and results of three major MTOs: Western Union, Transferwise, and Xoom. The former is the main incumbent of the market, while the latter two have emerged since the turn of the century and have each made their own distinct mark on the industry. The examples of both Transferwise and Xoom can show that there are positive opportunities for investors within this sector. Western Union is the largest MTO by dollar volume traded and, subsequently, it is a prime target for disruption by newcomers. Its hold over the market comes from an established and large network of brick and mortar affiliate branches, which bring physical convenience and brand awareness alongside a steady introduction of value-added services that have attracted corporate customers. One such example of these is Edge, a marketplace platform for customers to discover new clients and transact. FX rates change every split-second, so it can appear more opaque from a customer’s perspective in comparison to flat linear transfer fees. However in the long term, charging a customer more on FX will be to its detriment, as newer companies are following a strategy of being up front and transparent with these cost items. More effective market research about the changing competitive environment of international payments would have highlighted earlier to Western Union the shift towards FX rate transparency. Despite these issues, Western Union is still the largest MTO by transfer volume, with $80 billion exchanged in 2016. Due to the infrastructure that it has created and accessibility provided by its branch network, it’s safe to say that its position is not under threat in the short-to-mid term. A cause for concern, though, is the effect a continual stagnation of revenue growth will have on the business’ ability to service its vast network and retain relevance. As with many famous instances of disruption, Western Union is paralyzed by newcomers offering a simpler service delivery format, which restricts its ability to respond due to its complex physical logistics (it has 500,000 agents) and threat of cannibalization of existing business lines. As the largest Fintech “newcomer” in the MTO space, Transferwise is well positioned to become a major force in the industry. What is surprising about the success of Transferwise is that it appears to be making magic happen on razor-thin margins. The business famously does not earn any FX spread on its transactions and only charges clients a fee, which is at competitive prices versus its peers. It claims to use a peer-to-peer model of matching customers’ transactions off against each other, which negates its needs to transfer currencies manually (and expensively) via transactions with third parties in the interbank market. The effectiveness of this peer-to-peer system as a method to reduce costs is debatable, since it depends on an equal volume of money being transferred at the same time, in both directions, to make it work. Referring back to Charts 1 and 2, you can see that, with exception of China, money flows between countries in lopsided patterns. Considering that Transferwise is passing on midmarket rates to all consumers regardless of whether peer-to-peer matching is possible, it would be feasible to suggest that it is losing money on FX, considering its own operational costs and whether it itself actually has the luxury to transact at midmarket rates. So without any FX revenue, Transferwise focuses solely on fees for transfers, which at 0.5% for EUR to USD, are very attractive to consumers. Transferwise is offering this in a viable way by building out its business in a purely electronic, virtual manner. It has no branch infrastructure and only offers electronic transfer options, so customers cannot pick up cash in agent bureaus. If the business is now breaking even, this suggests that it has built up an efficient technological operation for dealing with money transfer processes, such as onboarding, KYC checks, and balance reconciliations. A hint at future revenue expansion was seen in 2017 when Transferwise launched the Borderless Account. This service offers customers virtual bank accounts, allowing them to be paid directly by third parties and then make distributions to physical accounts via traditional transfer. A natural progression of this strategy would be offering physical cards or NFC pay services, which would move the business toward capturing day-to-day consumer transactions alongside one-off international ones. If Transferwise does move toward acquiring a banking license, it would gain more flexibility to offer different services (such as lending), but its costs could rise substantially due to increased regulatory and compliance requirements. The advantages of this for the business could be profound, though, as maintaining passive customer balances will provide working capital support to offset the large swings that come with the territory of international money transfer services. Its growth has allowed it to build a platform of customers that have validated the service and allowed it to iterate an efficient technological proposition. With the business now working at scale, it can use its customer base to build further revenue opportunities via flexible API interfaces and ambitious plans for transactional banking. After IPOing in 2013, Xoom was acquired by PayPal for $890 million in 2015; following in the footsteps of its famous acquirer, it provides an example of a successful exit for investors in a remittance company. The service offered by Xoom is only available for consumers sending from the USA, but as demonstrated in Chart 2, this is the largest country market for sending money. This is a very narrow offering compared to the other two companies analyzed above; however, as Xoom is now a part of PayPal, a giant of the payments industry, both businesses can now upsell their customers complimentary services. PayPal has always been a pure electronic play for both consumers and businesses, but within the realm of payments, credit facilities, and invoicing. The focused nature of Xoom contributed to its successful exit. It did not try to be everything to everyone, but instead served its segment well. This provides a lesson to investors who may get swept away by a company’s ambitious plans to take over all elements of money transfer but who then become overwhelmed by the operational effort required to succeed. Xoom was an attractive company to PayPal because of the strength of its affiliate network around the world, which facilitated payouts in cash, mobile topup, and bank transfer. Before the acquisition, Xoom was placing pressure on Western Union through combining online send with offline receive. Customers would send money electronically via its website/app, but recipients could choose electronic or physical collection options at their end. The value of the business to PayPal therefore was to harness the offline elements while combining its own online ecosystem with Xoom to create an integrated service for both sets of customers. In the scenarios described above, MTOs need strategies to cope with lower fees and increased competition from technology, which is enabling upstarts to ramp up new operations quickly. All three examples show characteristics of how players can look to compete within a market that is becoming a commodity. The directives from the G20 and UN to reduce prices is stimulating a price war and offering an easy point of differentiation for newcomers to attract new customers. With the race to the bottom on prices becoming apparent, incumbents must find efficiency improvements and offer different value added services to stand out from the crowd. Value added services is the en-vogue trend to offer now, which should give the established players an advantage due to their high traffic and decades of customer data. The question is whether they have the means to analyze this data in a commercially useful manner and whether their legacy systems allow for it without a significant investment in data mining tools. There are many routes to take to find future growth; for example, Western Union is chasing businesses with its enhanced options for hedging and marketplace to connect buyers and suppliers, while Transferwise is targeting the consumer and moving down the road of becoming a bank. Both options provide the potential to encourage customers to make more transactions, which is how MTOs make money. It also makes the customer sticky, as the switching costs become more painful for them to move to a competitor. 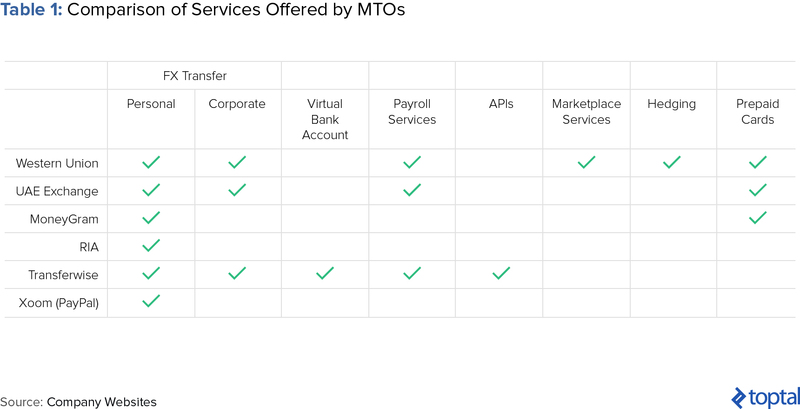 As highlighted in a previous Toptal article, payments businesses do not actually transfer money; they use other service providers’ infrastructure. In the case of MTOs, they have grown in prominence due to an increasingly internationally mobile population and their own dogged determination to do the ugly job of sending money, packaged up into a more compelling service than bank offerings. Brand Strength: Winning customer trust and engagement. Options for sending and receiving money: The array of countries and transfer options provided to customers is an advantage gained from having a deep bench of agents and correspondent banks. The valuation potential of money transfer companies depends on how many of these advantages they hold. For example, Xoom was an attractive business for PayPal due to the strength of #2, while it’s likely that Transferwise will continue to rise in value, due to its strength across all of the points. Hi great article thanks. Would be good also to consider Revolut, which has even lower fees than Transferwise, even for many cases 0 transaction fees and 0 FX fees. And it is moving toward international transfers and local bank accounts. In my opinion the business model of Revolut is much more solid than TransferWise, where Revolut is having profits in the use of the Debit Card and giving users 0 international transfers cost. @alspab . Thank you for the comment. Revolut is indeed a fast growing startup in the money transfer sector, offering services for personal and business users. However, as can be seen in Chart 4 in the article, it still has not reached a position within the top 14 MTOs (in transfer volume) and it is burning cash to keep operations running spending $1 for every $0.5 earned, according to an article from Business Insider on 29 Jun 2017 ( http://uk.businessinsider.com/revolut-valued-300-million-index-ventures-50-million-funding-2017-6 ) . Nevertheless, Revolut is a startup to keep a close look on to see if they prove their business model. Ripple XRP will eventually replace them all for actual transfer over the Internet. Cryptocurrencies are the future for banks and the rest to lower fees. 100 banks have all ready signed up. What about OFX? They transferred $20b last year in international payments and have global coverage. Offering individual, business (with Xero intergration), virtual accounts, API's, and white label banks and other MTO's e.g. Travelex online.